Many find out the hard way that web design is more than just slapping some words and pictures together and posting them online. At Web Creations By Z, we know that a solid web design often involves a lot of hard work... we mind the details and we’re ready to go to work for you. Analysis - We ask the right questions and most importantly, listen to your answers. Whether your requirements are basic or complex, our Website Planning Guide helps us to learn your goals and intentions. Then we present insightful ways to fulfill those goals. Once completed, the objective is clearly defined. Design - We translate your needs and goals into a web site that is original, cost effective, and ready to fulfill it’s intended role. Our documented Development Methodology insures that we consistently meet or exceed our client’s requirements. Testing - We sweat the details. We use multiple versions of multiple browsers to test and re-test each web site, ensuring that each visitor sees our client at their best and has a smooth, enjoyable visit. Through out this process, Web Creations By Z is mindful of the fact that this is your website, not ours. Whether a basic web site, a content managed site, or a web based application, in order for your site to be successful, it must meet your business needs, suit your organization’s image, as well as fit your budget. Web Creations By Z will take all of those factors into account and more... to create a site that is as unique as your business or organization. Our basic web site development package is designed to give you options on how the style, layout, and content are created. It allows you to use off-the-shelf components, provide the components, or have each aspect of your website designed by Web Creations By Z according to your preferences. Content - Many businesses and organizations already have a good deal of content and don’t realize it. Do you have a brochure, pamphlet, or form letter that you send to potential customers that details your product offerings? These materials can be a wealth of information and provide a jump start creating the text content for your website. Even if you don’t have any materials, our review of the Website Planning Guide will provide a good starting point. We’ll interview you and others to learn about your business. We’ll research other related businesses to learn about your market. We’ll learn your angle... the things that make your business stand apart from your competition and accentuate that message. We’ll make sure that your site contains the proper meta data to help the popular search engines like Yahoo!, Google, and MSN’ Live Search find your site. Style - Your website represents you to the online community. So its important that your website fits your style and meets your aesthetic preferences while performing the job you need it to do. Web Creations by Z uses information learned in the design phase to create a custom look that fits in with any materials you already have... or you can select from a wide variety of stock templates and have us modify them to your liking. 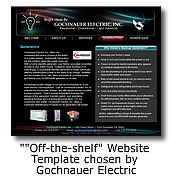 Images & Graphics - Many clients have existing graphics and images that can be used on their web site. In most cases, Web Creations by Z can use these materials even if some image manipulation (retouching) is necessary. We can also take pictures on location or obtain royalty-free stock images from several subscription services. Likewise with graphics. We’ll work with materials you supply, third-party materials, or create what your site needs... and if we can’t create it ourselves, one of our affiliates probably can. Database served content can really stretch your development dollar. It separates the nuts and bolts of the web site from the content. A single web page can be displayed as a template and used to display many different pages of content to the visitor. Frequently, this technique is used to display a company’s products in hierarchal format with distinct functionality for categories, products, and the product details. Each may have their own page, or module within a page. Take the Monarch Door Company web site shown on the right. The site appears to have five separate pages (categories) of product offerings, with category having a variable number of products. In reality, it is a single page with one module to handle category level information and another to handle the individual products. Both the content and formatiing instructions are retrieved from the database. This flexibility allows the web site to be easily modified to keep pace with their business. A more familiar application may be an artist's gallery, such as see at the A.T.Williams Art site, or the Visionary Fusion Glass Works site. In both cases, the gallery is a single page designed to display all of their works. Images and wording can be easily added or modified. Clients who require frequent changes may wish to add an interface that allows them to manange the information that appears on their site. Learn more about custom content managed websites. 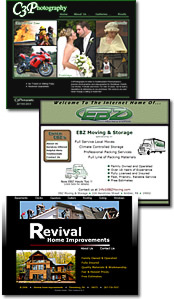 Take a look at some of our recent projects or contact us and find out what Web Creations By Z can do for you.